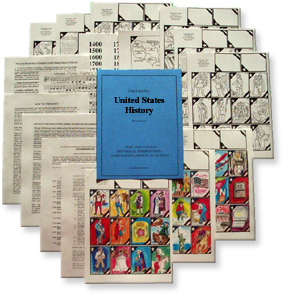 United States history: a history packet from Time Lines Etc. This is our most popular packet. It begins with the discovery of America by Columbus and ends with the Internet. Included are four maps, a "Know the Presidents” activity which helps students quickly learn all the U.S. Presidents in order, a principle-based study guide, and a musical score for the "History in Action” summary. Or click here if you prefer to order by mail.